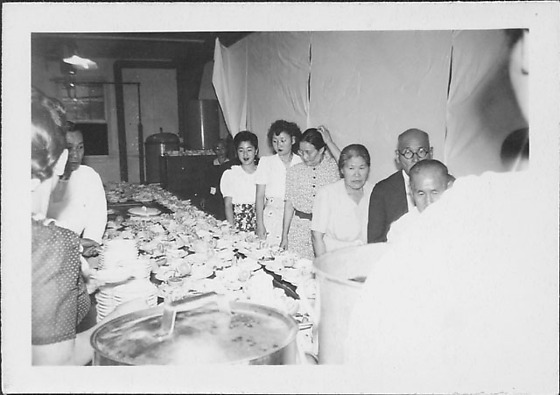 Five men and women stand in line next on far side of counter covered with plates of food at mess hall at Rohwer concentration camp, Rohwer, Arkansas, 1942-1945. Mess hall staff stand on opposite side of counter, left. Partial view of a person's shoulder in foreground right next to a large covered metal pot. Two elderly men stand at front of line, followed by an older woman and a woman scratching her head; two younger men at end. A woman in dark dress with white collar walks through opening in white sheets hanging in background. Same location as 97.292.16F, 16G, 16J and 16M.